Comments: The road (Route 20) between Scottsville and Charlottesville was known as the 'Road of the Presidents' in the 1800's because Presidents Jefferson, Madison, and Monroe often traveled over it. In those years, the trip between the two towns was arduous and bone-jarring as the macadam used on the road was a thin, poor tar mixture that soon broke up under heavy wagon traffic. Then rains would further plague travelers as they slid around on the rutted, muddy road. Until 1884, all male citizens in the county between the ages of sixteen and sixty (ministers of the gospel excepted) were required to work on roads near their homes for several days each year. This system resulted in haphazard road maintenance, and many travelers might have agreed with Thomas Jefferson, who, watching a balloon ascent in Philadelphia in 1793, wrote to his daughter, "I wish for one sincerely, as instead of 10 days, I should be within 5 hours of home." 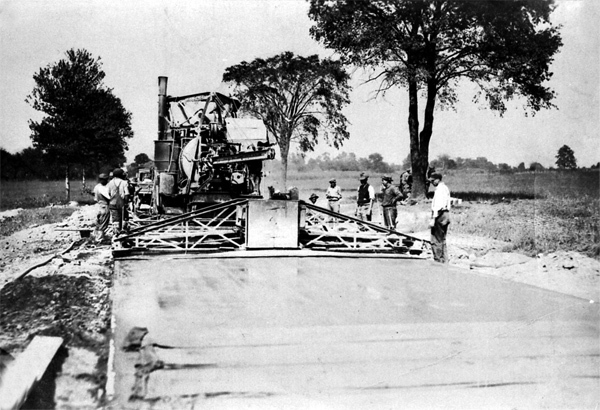 The two photos on this page show the paving of Route 20 with concrete by Maloney Paving Company in 1921, the first road in the county to be paved with state funds. 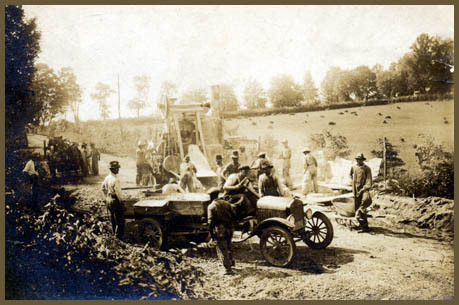 By 1922, there were only 73 miles of paved roads in Albemarle County. Due to the improved travel conditions on Route 20 and increased availability of automobiles, Scottsville residents became more oriented toward Charlottesville as a marketplace. Before this time, following first the James River and Kanawha Canal and then the railroad in 1881, Scottsville thought of Richmond and Lynchburg as commercial centers as it was not connected to Charlottesville even by train. Until 1956, a passenger train from Richmond to Lynchburg (and beyond) stopped daily in Scottsville. A relic of these days is the continued routing of Scottsville-Charlottesville mail through Lynchburg.